Like many others are you to wondering what is a zen garden? A zen garden is a Japanese stone garden, which mostly consists of gravel, stones, and boulders. These are created using curved lines which have served the zen monks for centuries as part of their meditation. In Japanese, these unique gardens are called Kare-san-sui, which translates to dry landscape or a fake landscape. These barren landscapes, known as zen gardens, have enjoyed great popularity in our region. The reasons are quite obvious. On the one hand, this type of garden is easy to maintain, especially when gravel is used. On the contrary, they look visually appealing and forms a quiet oasis in your own home which helps you escape the hectic everyday life. 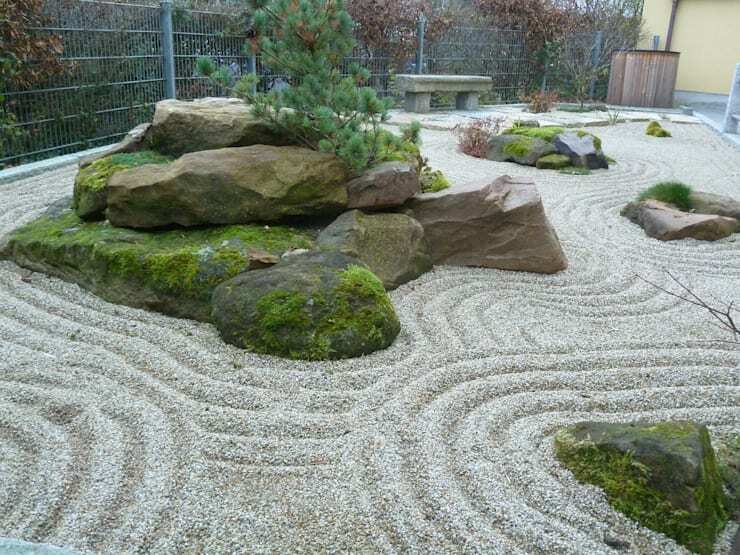 Here are 10 of the most beautiful Japanese inspired zen garden designs which will help you create your own landscape. One reason why people choose a zen garden is that it has a relaxing effect. 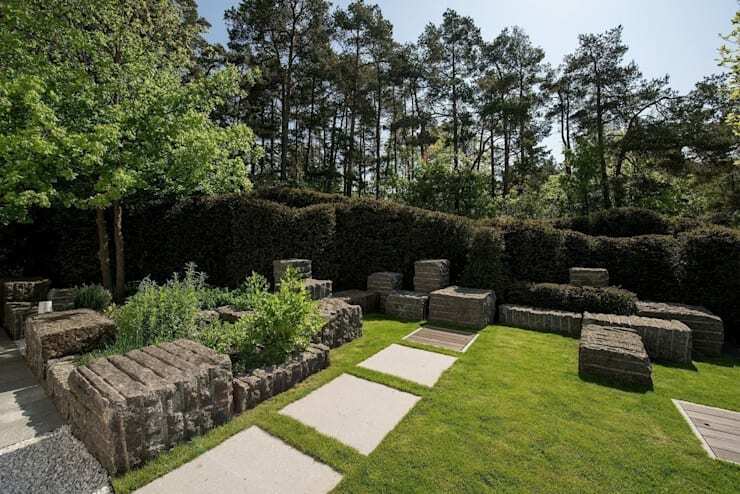 These stone garden's can also help reduce the level of stress that we face in our daily life. 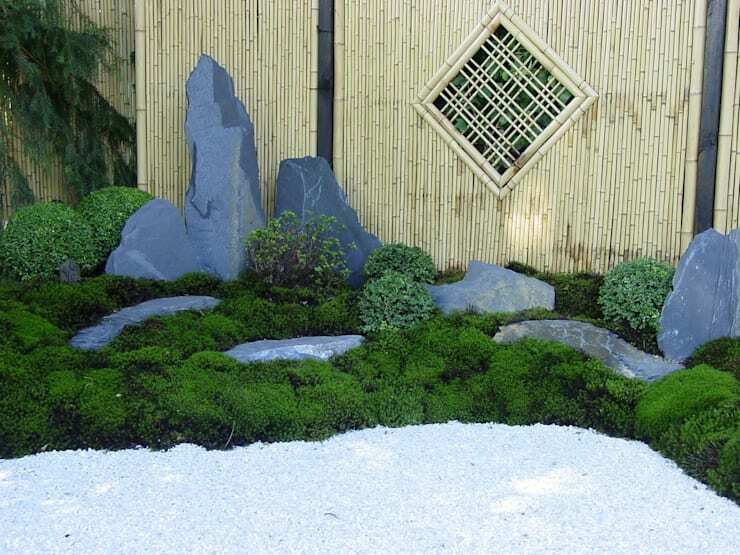 A real zen garden does not use a lot of plants or water and focuses mainly on Moss. The gravel or sand surfaces in such dry gardens stand for streams, rivers or the sea. In order to, work out this symbolism, the stone surfaces are also provided with wavy lines with the help of special wooden racks. Drawing these lines in the sand has a meditative effect which ensures serenity and relaxation. It is important that one is not able to recognize the beginning and the end of these lines. They should pass gently into one another. The pattern of lines should also emphasize the boulders which represent hills and mountains. In general, all geometric forms should have a natural appearance and must be used in odd numbers. Another reason to prefer a Japanese dry garden for your home is that it can be created almost anywhere. 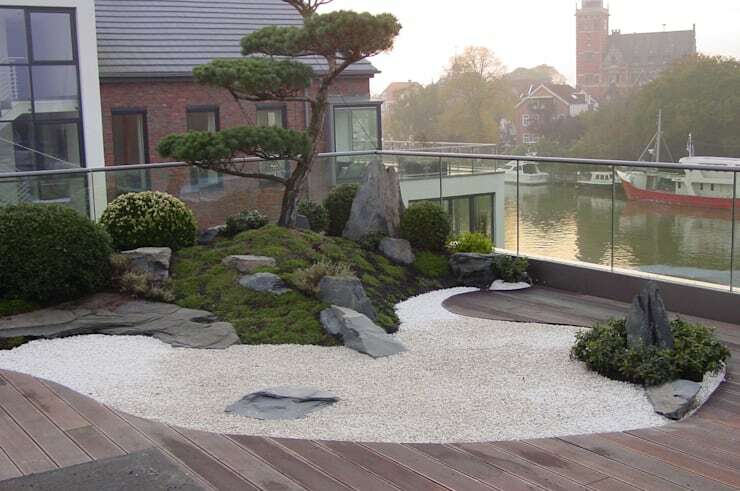 Here, a zen garden is laid out on the terrace overlooking the river. But you can also choose a miniature variant of this landscape which can be placed inside the house. The typical wave patterns were not used for this garden, but the basic shape of the gravel surface still looks like a single giant wave. It makes it an exciting variation of the classic dry garden. If one wants, they can cover the entire garden this way, or just the corners of their outdoor space. zen garden can also be created on balconies. Another point that speaks in favor of zen garden’s is its versatility and ability to transform even the most gloomy space into a well-planned oasis. For example, in this photo, there is no sign that this Berlin house was once a dull and lifeless area. Rock fragments, moss and a fence made of bamboo now embellish this garden in an authentic Japanese style. The good thing about such dry gardens is that it does not need any particular weather conditions to grow or thrive. On the contrary, since this garden form consists of stone and gravel, any inhospitable corner can be converted. For those of you who do not have enough space to create a lawn, little zen gardens are ideal. These are not only easy to lay out but will also provide a relaxing and meditative feeling in a playful manner. 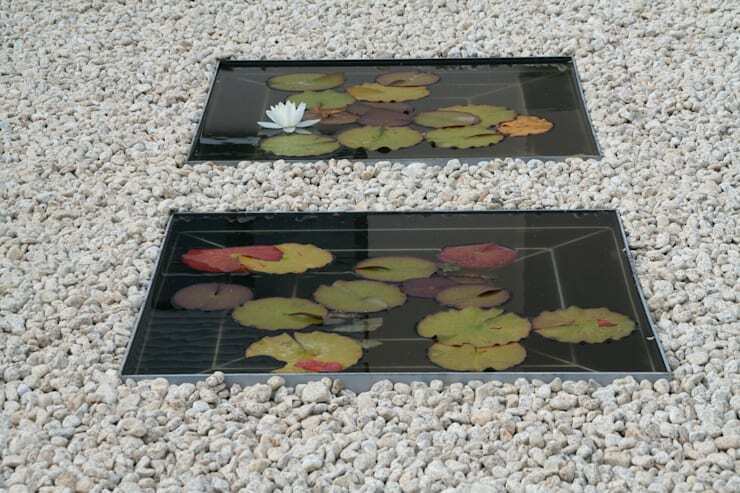 For such gardens, a rectangular frame is usually preferred, which can be filled with sand, pebbles or even semi-precious stones. With a small wooden rack, you can also draw new patterns on the surface. One can also place a bonsai in this little garden if they wish. Here one can see a miniature water lily pond which was built between the pebbles. 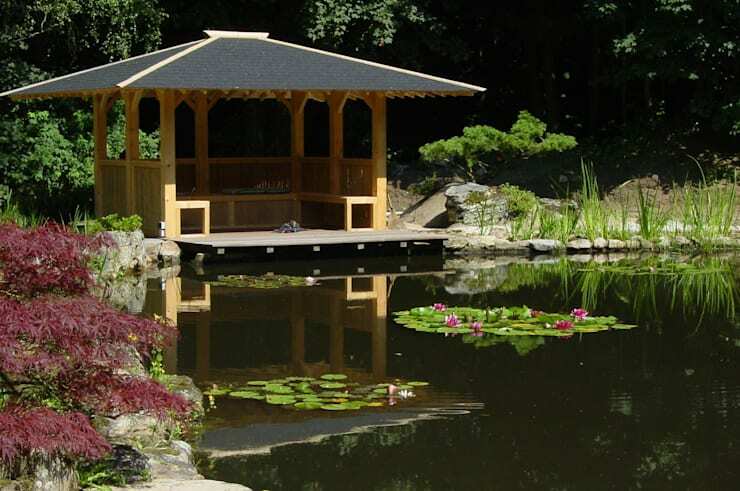 This picture of a beautiful Japanese garden in the Eickhof Castle near Liebenau is reason enough to get one created for yourself. Since 1996, Japanese gardening techniques have been celebrated world over. In 1998 a zen monastery was also converted into these great garden landscapes. The natural pond and tea house of this garden complete the idyllic overall picture. This zen garden is used as part of the training for the zen monks. 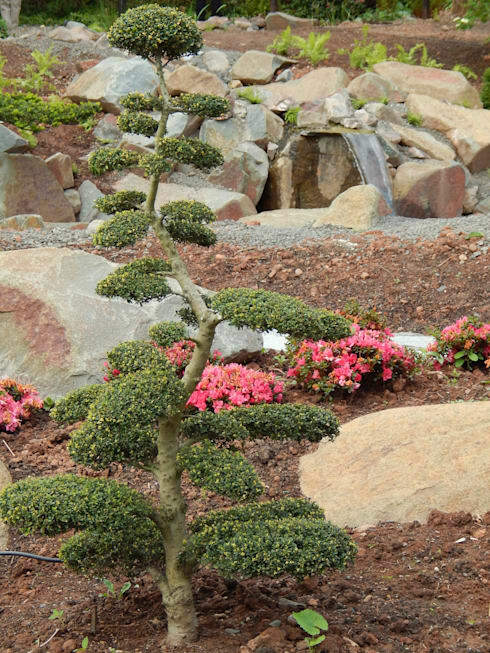 At this private garden in Bremerhaven, Japanese gardening techniques add the finishing touches. Here, various plants and water have been integrated into the garden which means that it does not belong to the traditional design. This, however, was not the goal. We believe that a garden design should be created, in which nature and cultivation showcase a harmonious balance. Such gardens are also meant to improve the state of mind. 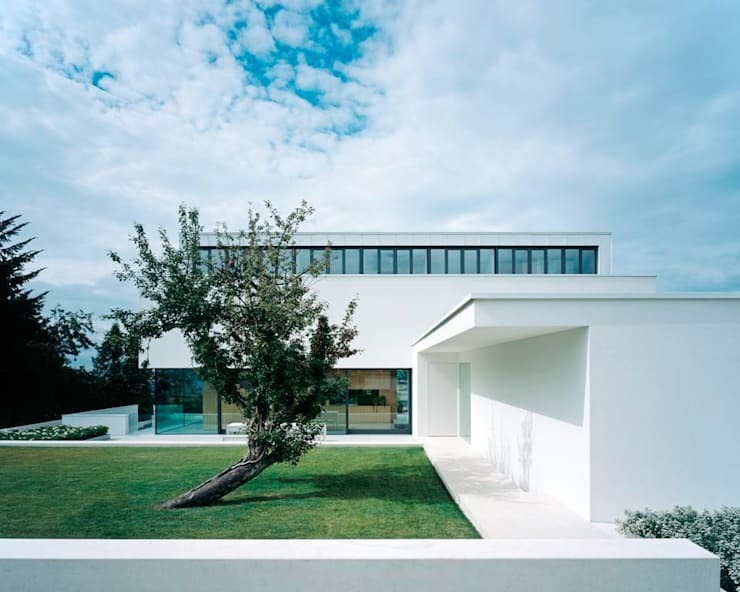 The design of this house is modern and geometric. The green area in front of the house is also extremely pure, giving it the appearance of a Japanese garden. A single, dramatically planted tree within the garden gives it a beautiful touch. This view is an excellent example of a reinterpretation of the traditional Japanese garden for modern times. Bonsai is small, well-formed and aesthetically shaped saplings. These are also extremely popular. Although, these trees do not fit into traditional dry gardens, but are perfect for creating a Japanese inspired space. So if you only want to have a garden with a Japanese flair without adhering to the rules of zen gardens, then such mini trees are the ideal choice. However, one should first cross check details, as to which sapling is suitable for which place. Because Bonsai trees require in-depth care, special lighting, and weather conditions to grow and flourish properly. 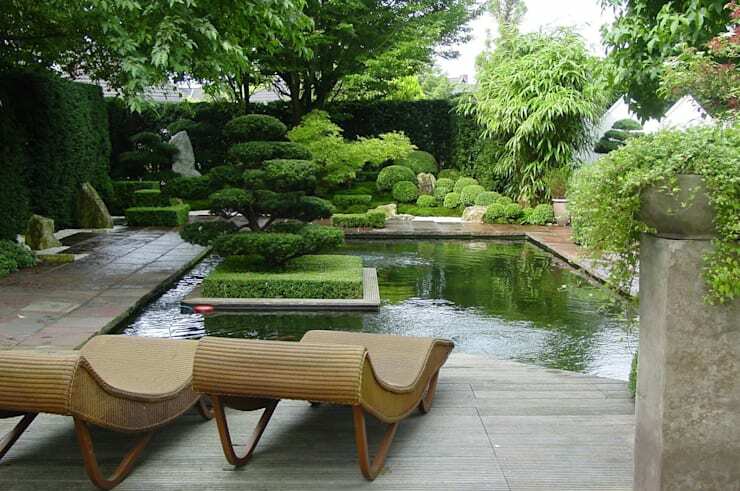 Here you can see a design of a Japanese garden, which works as a private space for the family. This evergreen living room has been protected from all sides by paying special attention to the design. Also, the space can be used throughout the year. In the next picture, you can see the finished garden. 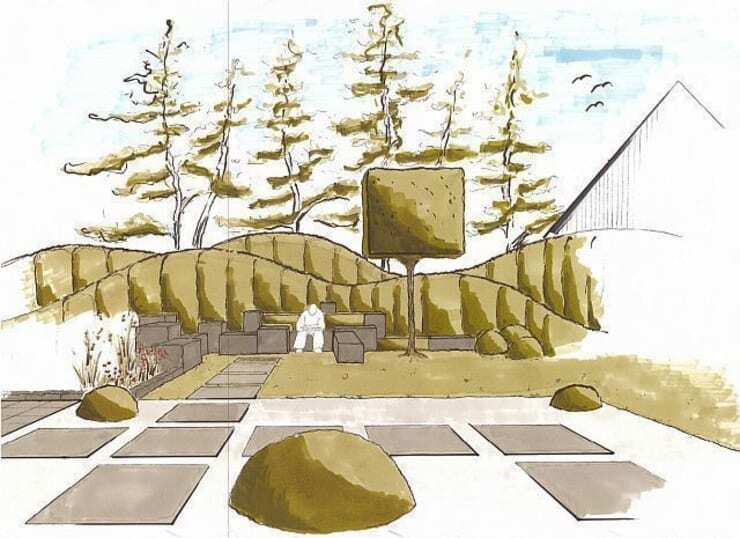 This garden was designed with granite and yew. The granite blocks can be used as outdoor seating by lining them with pillows. The fireplace provides enough light and a pleasant warmth. There is also a herb bed in the new garden. Through the granite blocks and the plantation, the entire outdoor area receives a relaxing Japanese flair. 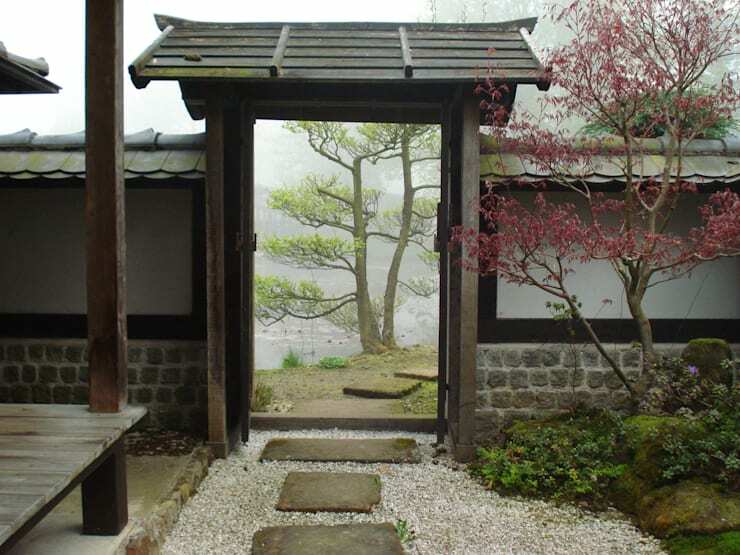 Lastly, the most important reason to go for a zen or a Japanese garden is the experience of nature. It does not matter whether you adhere to the strict requirements of a traditional zen garden, meaning you may even integrate plants and water into the design. The main thing is that you can feel good in your garden. Along with being in harmony with yourself and nature. Are you ready to create a zen garden in your home?